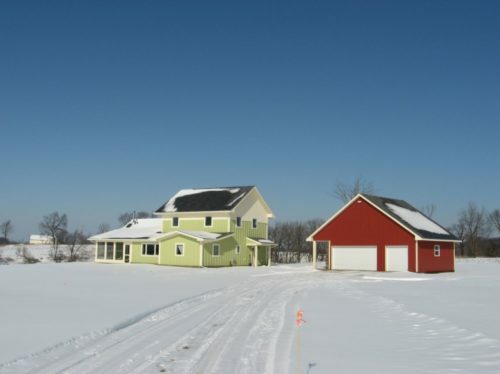 In late 2016, two clients broke ground on a beautiful rural site in Michigan. 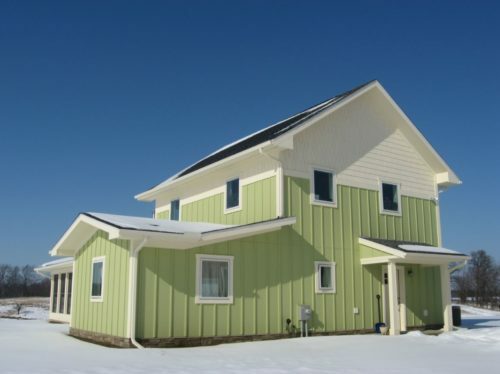 Their energy-efficient farmhouse has been featured on the blog, first here and then again here. With the project being built hundreds of miles away, regular site visits are a challenge for me, so it was a delight to receive an email from the clients with updates. All the text quoted below is from the homeowners, lightly edited. “The really good news is that the design of the house is working out very well. The layout provides good separation between public and private spaces. It’s great to roll out of bed and into the kitchen. The house is cheerful and full of sunlight. The small front foyer is a delightful detail that is enjoyed from the music room, and the staircase invites further exploration to the second floor. Sight lines are long but broken up by small angles and structural details. The great music room is wonderful: it can accommodate 2 lazy retirees or a small crowd of energetic children + dinner guests. The long narrow dining hall is perfect for buffet dinners; guests drift into the music room to have their meal, rather than hanging out in the kitchen (hooray for efficient galley kitchens). We are hard pressed to think of how to improve the design, given the challenges of the property with its drainage swales, cemetery and neighboring pipeline. Thank you Mary for your expert input, patience and perseverance during the design process. Yes, we finally got the stairs in the right spot! 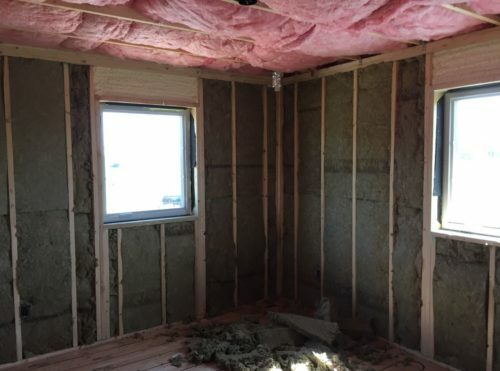 “Roxel insulation [a kind of bat insulation made from stone and other minerals, and pictured above] has changed their name to Rock Wool. So far, we are oblivious of its existence: warm walls, no smells, no nothing. We have noticed a very nice reduction in sound transmission from outside noises. We missed an opportunity by not having it installed in some of the interior walls. Absolutely, we would specify it again. “We are very sympathetic about the allergies. We have noticed a dramatic reduction in dust with the complete lack of carpeting. Hooray. The Sherwin-Williams low/no VOC interior paints are excellent: no smells or off-gassing. The Summit engineered wood flooring is wonderfully neutral. No smells. It is absolutely worth the added expense to specify the no-VOC materials. 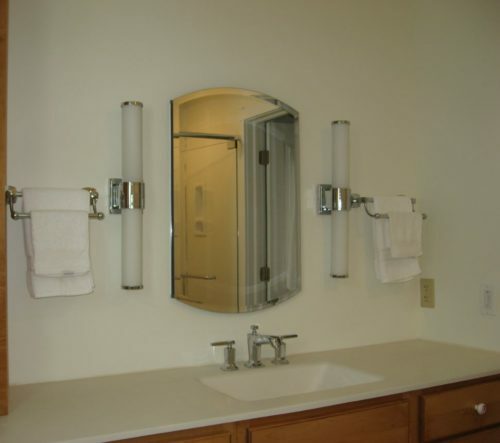 Above, the custom-sized towel bars are just one of hundreds of details that make the house unique. “In-floor hydronic heat is different. We like it. The neighbor’s children love it on their bare toes. Clean, no wind chills, no dust flying around. In spite of all kinds of pumps, valves and mechanisms spinning away night and day during December (pre-Christmas low = -14°), the electric bill was about $75. The propane bill was considerably higher! We need to get curtains in the windows to cut down on heat transfer. Yes, the wood stove really works to keep things warm, and the AC circulation fan does a good job of distributing the heat throughout the house. One consequence of hot water heat is a dry house. Good news: the house has finally dried out after last winter’s drenching, and we have gaps along the caulk fills all over the place. The other downside is a tendency to have scratchy noses; we just need to purchase a small portable humidifier to take care of that problem. After fighting the mildew in our Lakeville home, it is a vast relief not to have to live with that health hazard.